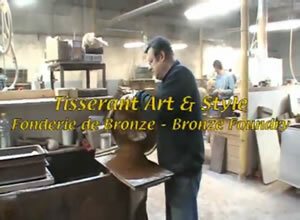 TISSERANT had, since 1930, three generations of craftsmen bronze-founders rediscovering and perpetuating the degree of perfection reached in the 18th century in producing bronze luminaires and furniture. TISSERANT expertise is recognized by the curators of the world’s greatest museums, and decorators, interior architects, and collectors around the world. Heritage of the past – and heritage for the future. 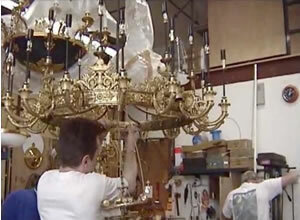 When the Palace of Versailles entrusts TISSERANT with restoring its chandeliers, they are conserving the past. And when they light the reception hall in the Bangkok Royal Palace, they are contributing to the world heritage of tomorrow. In this way, they are fortunate enough to be at a crossing-point of cultures, generations, and passions. France has awarded Tisserant Art & Style the “EPV” mark – (Entreprise du Patrimoine Vivant, “Living Heritage Company”), awarded to companies holding unique craft and industrial expertise. Gives shape to the cartoon and defines the volume. Sculpts the model that will be used by the founder. Produces the ‘master model’. Creates the imprint in the sand where the bronze will be poured. “Casting is often a delicate operation that demands of its workers care, intelligence, and a very light touch.” (“Dictionary of Crafts”, 1854). “Smoothes out” the material using gravers (which he makes himself), perfects the curves, accentuates the reliefs, creates the interplay of light and shadow. “CHASING. This is the art of enriching and embellishing works in gold and silver and other metals, by designs and sculptures that are represented there in bas-relief.” (“Diderot and Alembert’s Encyclopædia”, 1751). Lays down a fine layer of 24-carat gold on the bronze. 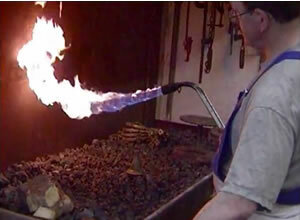 Burnishes the metal. Takes care of patina and finishes. Harmonizes the tones. Has an encyclopaedic knowledge of metals. A very delicate craft if ever there was one: it takes many years of practice to become head of a gilding workshop. Works round pieces. Applies decorations. In “Diderot and Alembert’s Encyclopædia”, it took no less than 88 plates to illustrate all the richness and complexity of this craft. Brings together all the pieces of the jig-saw puzzle. A chandelier may have several thousand pieces (the lantern ordered in 1777 by the Count d’Artois for Bagatelle has 1,000). The attachments and fixings have to be concealed, taking into account the character of the materials and being vigilant in terms of fragility. The final appearance – and the whole magic of the object – will depend on this impeccable assembly. So that, from dawn till dusk, “the silent beams of light are reflected from chandelier to glittering chandelier.” (Henri de Régnier, on the Palace of Versailles in La Cité des eaux, 1902). Makes the light sparkle. Assembles the crystals, composes the rosettes, fits the crystal components and dresses the chandelier. Rock or Bohemian crystal, frosted or smoked, pink or opal… a complex optical interplay is what lies at the heart of this type of luminaire. “There is no more sparkling material than crystal, multiplying light infinitely as it does. Hence why crystals are the leading luxury article today.” (“Dealer’s manual”, 1854).